My musical career began at the age of 12 when I saw my cousin’s husband playing the guitar. I said to my mom, “I want to learn how to do that.” She got me a guitar and I took lessons. I was most interested in folk music and soon learned to figure out chords to the songs that I wanted to sing. In 1981 I played in a duo called Sweet Harmony. Later in 1987 I played bass in a band called The Swing Beans with Dave on Mandolin, another Dave on violin and “Lentil Bean” on Guitar. We all sang, traveling all over the Northwest as part of the Oregon Arts Commission, and we had a blast. In 1992 our daughter Rosiee was born. We weren’t ready to end our Swing Bean career yet, so we took a nanny with us and for 2 years continued to play gigs all over Oregon, California and Washington. We put out 2 albums: Groovin’ in the Garden, available only on tape, and Dessert First, available on tape and CD. I wrote about half of the songs on both recordings. (See our Music page for more information on these). Also in 1992, we began attending the ISFHC Harp conferences. Perhaps some of you remember Rosiee as a baby in the lower exhibit room at the San Diego Conference. By 1996 in Tacoma, I was inspired to learn to play. Rosiee had just started going to school full time and it opened up the space for me to start taking lessons with Laura Zaerr. Some of you may remember Rosiee in Tacoma giving away pebbles as you went into the concert hall one night. What a life change playing the harp has made. 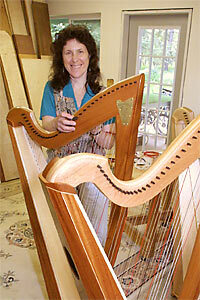 I began taking on more and more responsibilities with Thormahlen Harps. In September of 2002, I completed the Music for Healing and Transition Program (MHTP). I work in the hospitals, nursing homes and for hospice. It has opened up a whole new world for me. 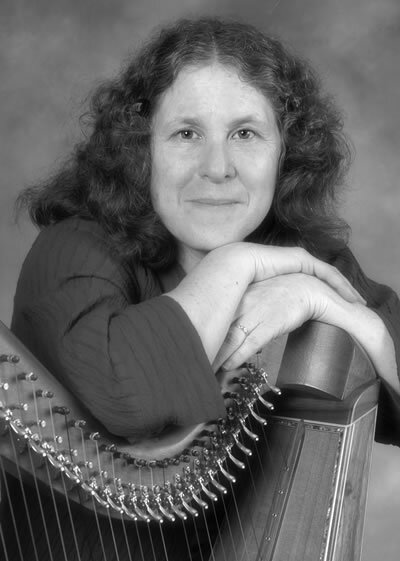 I have 13 music books, some of which are of my original compositions written on the harp and some are of arrangements of traditional tunes. 'Tis the Season includes my arrangments of Christmas Carols and Shalom is a collection of Jewish tunes. (See our Music page for more information on these also). 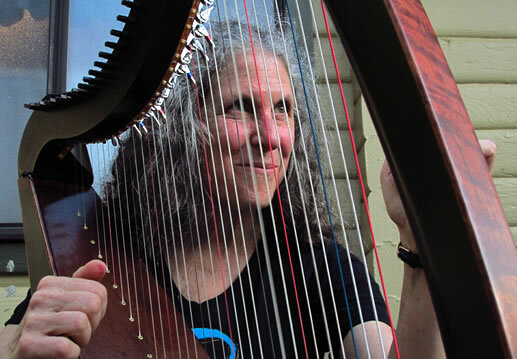 My duties at Thormahlen Harps include answering the phone, customer service, ordering materials and supplies, stringing the harps, keeping the books and playing the harps! One of the things I love most about working at Thormahlen Harps is getting to be intimately involved with every harp that goes out of here and getting to know our customers. Stringing day is my favorite. 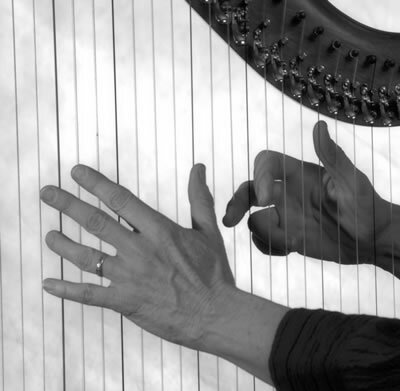 The harps coming out of the shop and into the studio are wonderfully new and beautiful. 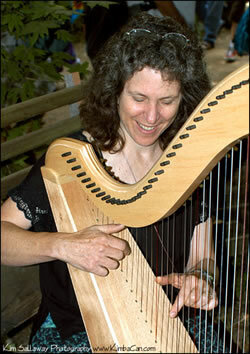 I put on a variety of new and favorite harp CD’s and spend the next 4 hours or so stringing up and tuning the new harps. I tune them daily for the next 2 weeks making them ready for Dave to lever and ship out. 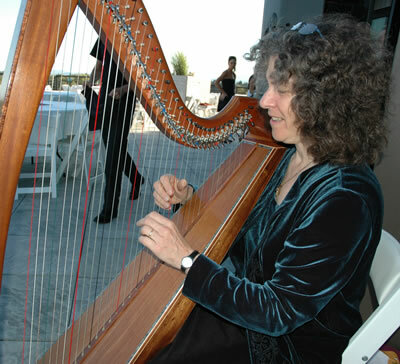 I also love going to conferences, and playing the harp whenever I can. 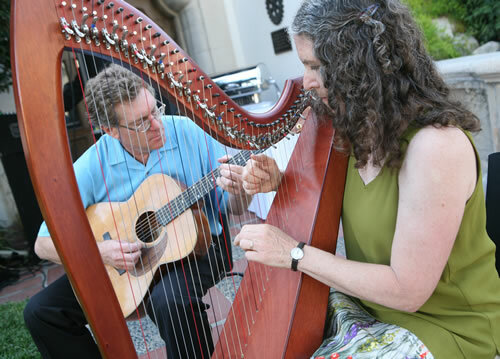 Dave and I are playing together these days, he on mandolin, guitar and banjo with me on harp. We are putting out a new CD which you can read about here. Dave and I live on a quiet rural road close to town. This suits us very well, because not only do we have the advantage of a country feel to our home, we are close enough to town and other activities to ride our bikes wherever we want to go. We have big conifer trees around our house and a garden out in front that often gets neglected when we go away over the summer. We have blueberries, raspberries and an Asian pear and cherry tree. We have a Yellow Lab dog named Sunny. We love to go backpacking, sailing, and cross country skiing. Our daughter, Rosiee, graduated college in June, has a job in Corvallis, lives on her own and loves West Coast Swing dance, reading and writing. Something fun I did once was to sit for an painting class at the art center here in Corvallis. Check out the scene. Read about Tommy or go on to the Levers page.